“That black sculpture was a Marianne of liberty, but not a Marianne of the French Republic. She undoubtedly represented something, but not the French Republic,” Mayor Marcel Allegre from Fremainville commune, Val-d'Oise department in northern France,toldLe Parisien newspaper. Allegre, who won local elections in March, last year, has now ordered a new statue in the city hall. It’s not yet clear what the new statue will look like. 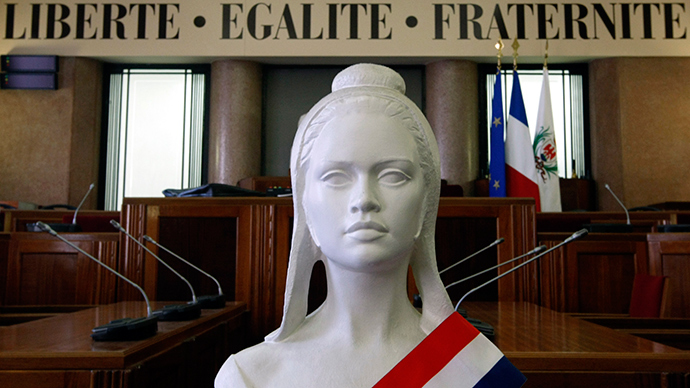 Marianne, a national symbol of the French Republic and an icon of freedom and democracy, is seen in many places in the country and holds a place of honor in town halls and law courts. She is depicted as a young white woman wearing a Phrygian cap. Since French revolution many cities erected the statues to the liberty symbol. One of the best-known Mariannes can be seen in French painter’s Eugene Delacroix masterpiece ‘Liberty Leading the People’. Though Marianne is considered to be a national symbol, there is no official legislation how France’s liberty symbol should appear. Recently, statues have appeared depicting Marianne with black skin. One of such monument can be found in Fremainville, a town of 495 residents. The village was the first to host the iconic monument with African traits in the town hall where civil marriages are performed in 1999. The black Marianne’s ‘eviction’ sparked outrage from the country’s minority rights groups. “Either we live in a white and racial Republic, and Marcel Allegre is right, or we live in a diverse Republic, and the mayor of Fremainville is wrong,” the spokeswoman of Representative Council of France's Black Associations, Thiaba Bruni, said in a statement. The organization said it filed a legal complaint demanding to sanction the Fremainville mayor. CRAN was also calling upon France’s National Association of Mayors to pick “black, Arab or Asian woman” as a new Marianne. The decision of removing black Marianne sparked a row in social media. “I know her, she is very beautiful. And that's a shame, especially in these troubled times to do this,” wrote René, a commenting user on Le Parisien. There were also some users on Le Parisien website who supported the eviction of Marianne Noire. “We need to stop massacring the symbols of our history in the name of ‘multiculturalism’,” commented ‘JJ’. “White or black, and why not yellow, our MARIANNE has always been white because we are in France, until proven otherwise, we are a white country,” added ‘Freddy’. Later, Marcel Allegre told Le Parisien that he will place Marianne Noir in another municipal hall. Black Marianne is also seen in the town of Bobigny, in the northeastern suburbs of Paris. She has Negroid facial features and the breasts and protruding belly characteristic of African statuary of women.